We stayed at Thistledown Country Retreat in a small self-contained cottage surrounded by rolling hills and jagged mountain peaks. 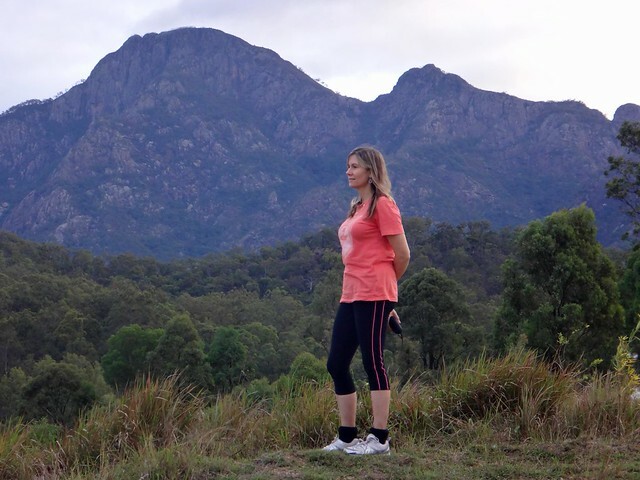 As we sat on our back deck soaking up views of Mount Barney we were sure we had chosen the right place to stay. 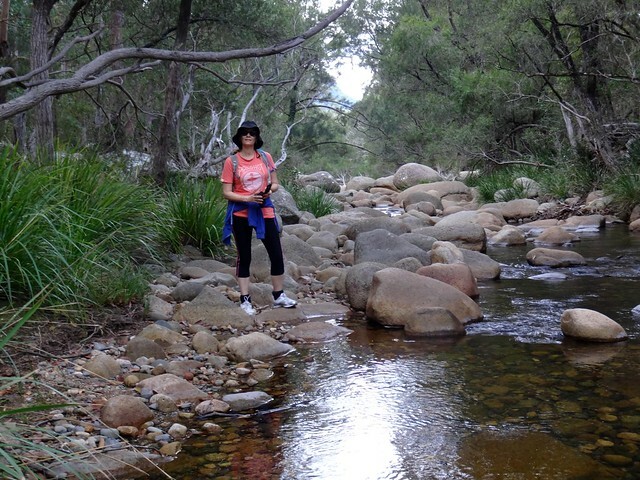 Our first adventure was to the Lower Portals – the upper reaches of Barney Creek as it tumbles down the northen face of Mount Barney and flows over rocks and boulders. 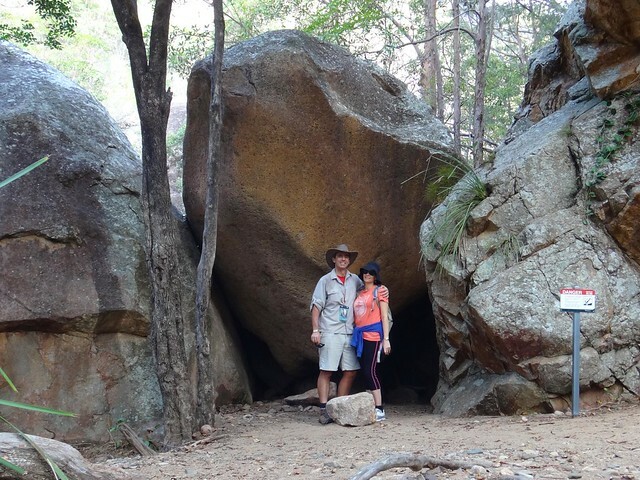 Some of the boulders are huge, and we briefly pondered what it would be like to camp the night here under one of the larger monoliths… before remembering how cosy our cottage and its fireplace would be that night. 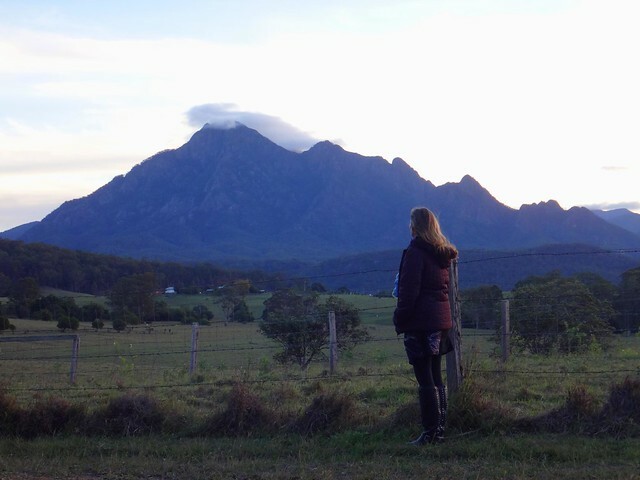 As the peaks of Mounts Barney, Maroon and Lindesay loomed over us from different directions, we decided it would be worthwhile to take a bit of extra time to soak up the views. The walk from the car park to the portals is over an hour brisk walk each way. Some of the sections involve steep climbs and a little bit of boulder hopping. It took us just under three hours including breaks. 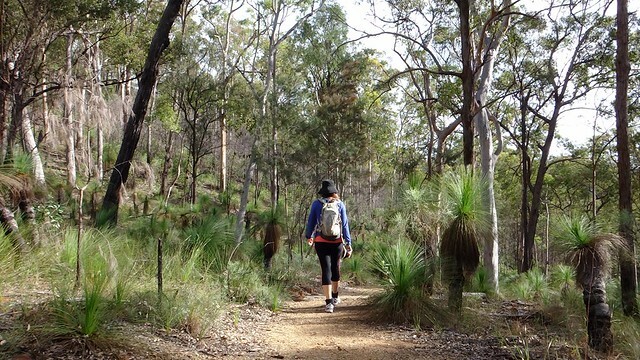 The next day we headed south into the Border Ranges via Running Creek. Our route followed the creek as it wound up the valley towards Richmond Gap. 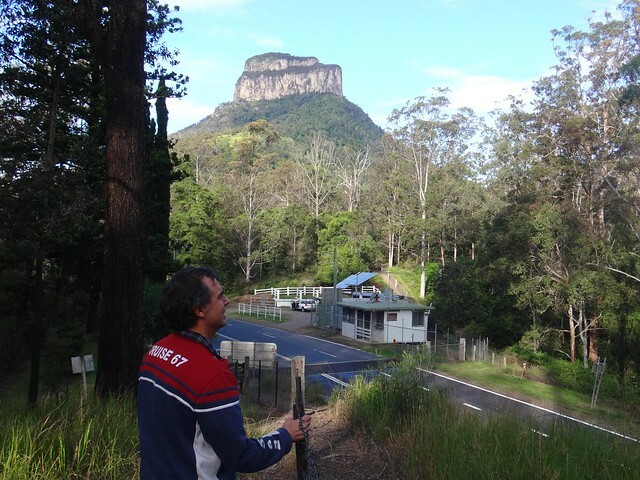 The roads here are winding and narrow, so we decided it would be best to take our time and enjoy the views rather than rush to our destination. 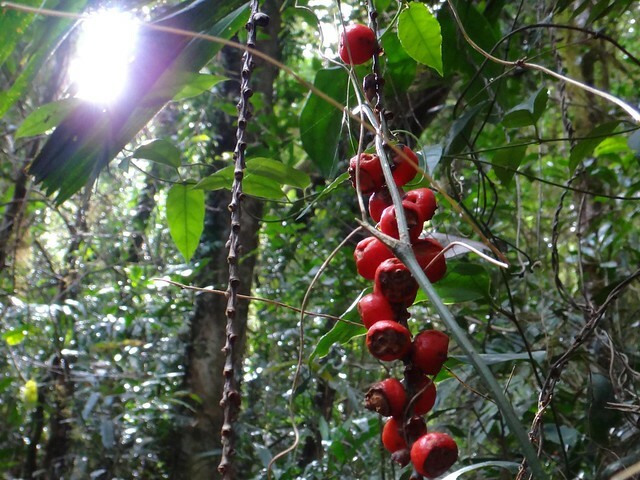 We followed a short track past trees adorned with moss and bright red berries to the highest point of the trip. 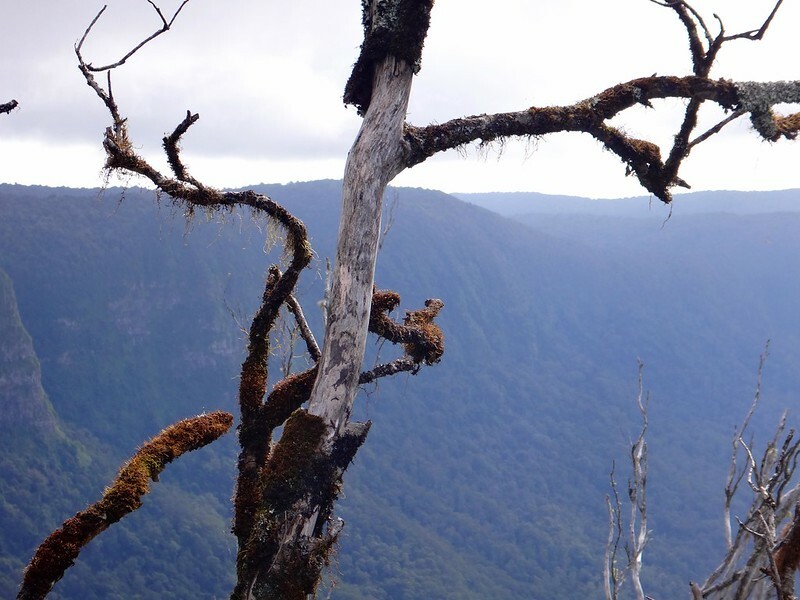 I usually associate rainforests with heat and humidity, but at over 1,100 metres above sea level this place was cold. 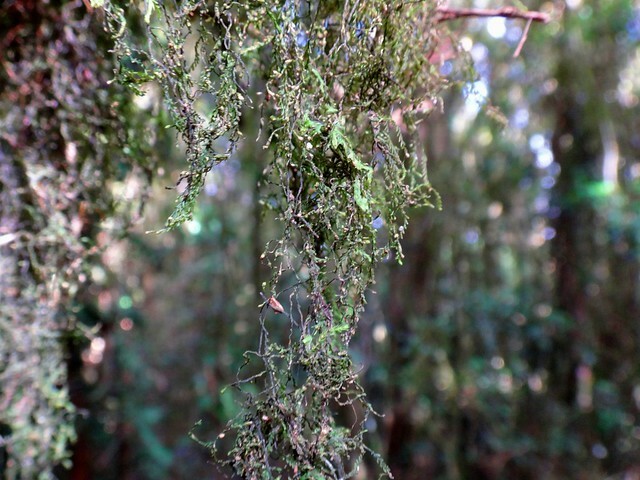 In the dark green shade with mere flecks of sunlight and a stiff breeze, I was glad I had brought some warm clothing. Suddenly the forest opened up. Cliffs dropped to our left and right as we followed the narrow path along a sharp ridge to the viewing platform. Views of the Tweed Valley stretched out below us in every direction. The vista spread for almost 360 degrees. 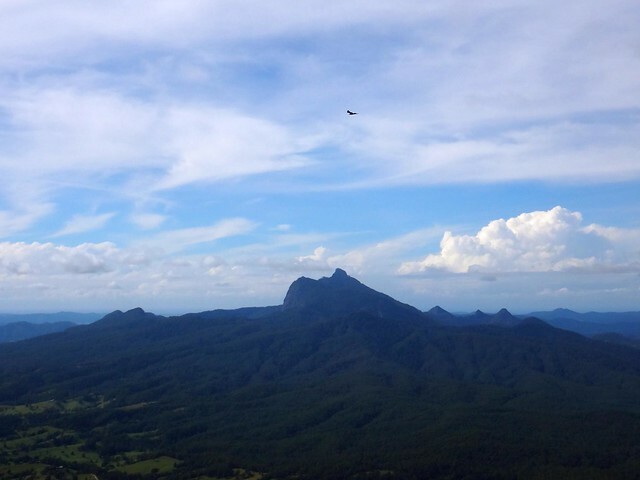 In the distance, “Wollumbin” (Mount Warning) poked his rocky head into the clouds. 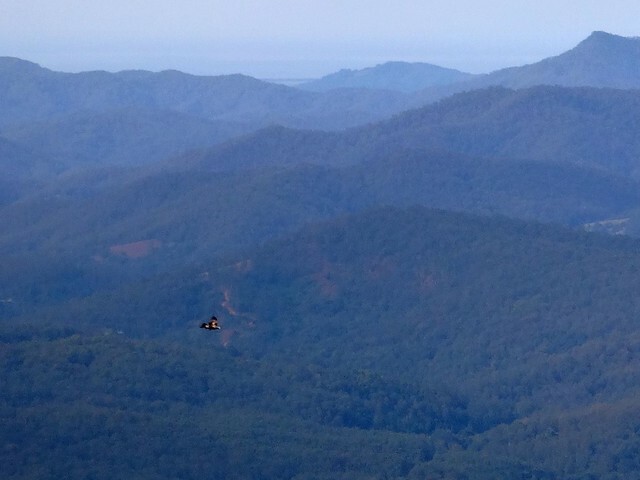 Further along the range we watched breathlessly as eagles soared silently in the void above us, drifting effortlessly on air currents. 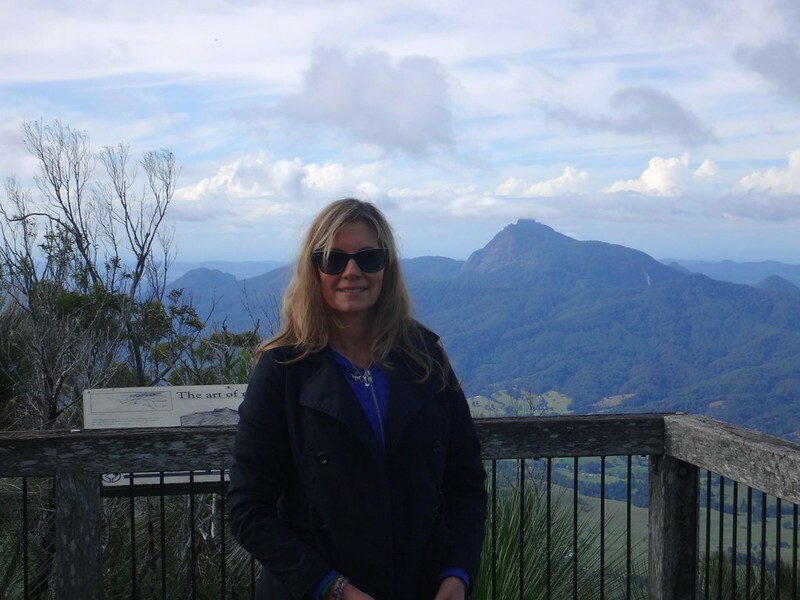 I think the Border Ranges is a “must see” place to visit. 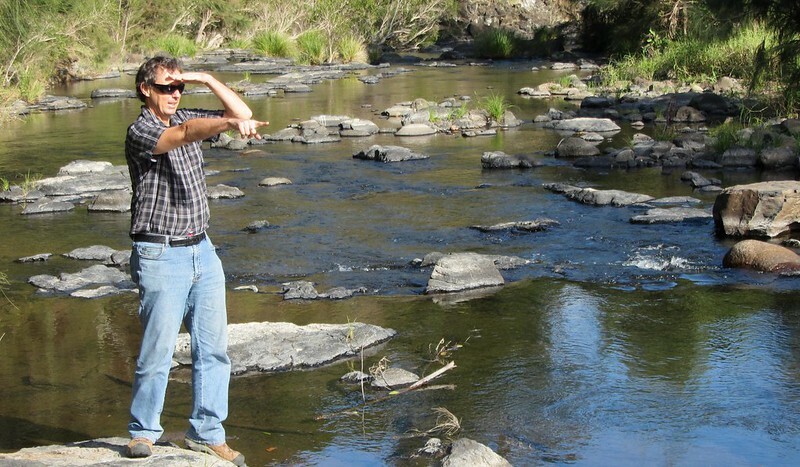 It’s only an hour’s drive from Rathdowney, or about three hours from Brisbane. I never tire of such amazing scenery. 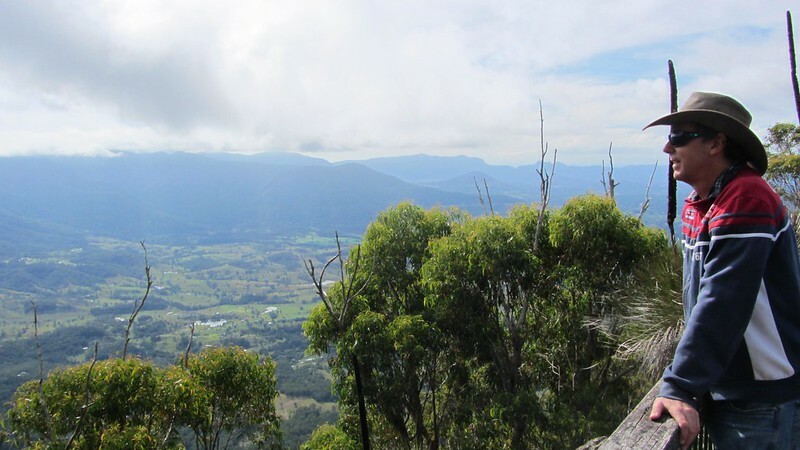 Rather than drive back the way we came, Liz and I decided to return to Rathdowney via Summerland Way and the Mount Lindesay Highway. 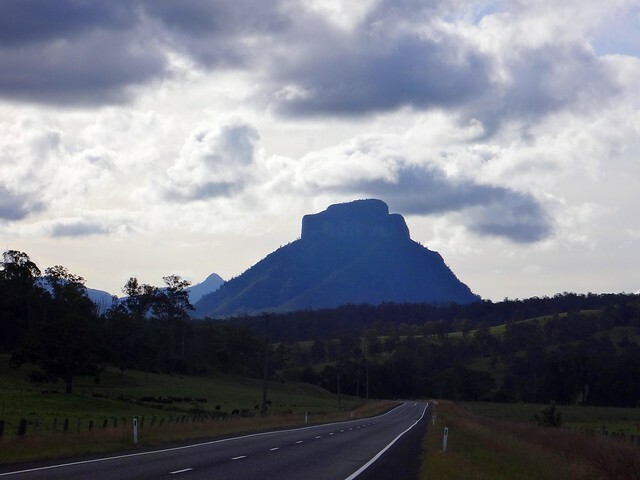 The strange square top of Mount Lindesay dominated the skyline as we drove, leaving us in no doubt why the highway was given its name. At the border between NSW and Qld I got out and had a bit of a look around. The rabbit-proof fence cuts a swathe through the forest here, and I was curious as to whether or not it would be worth returning on a bike. 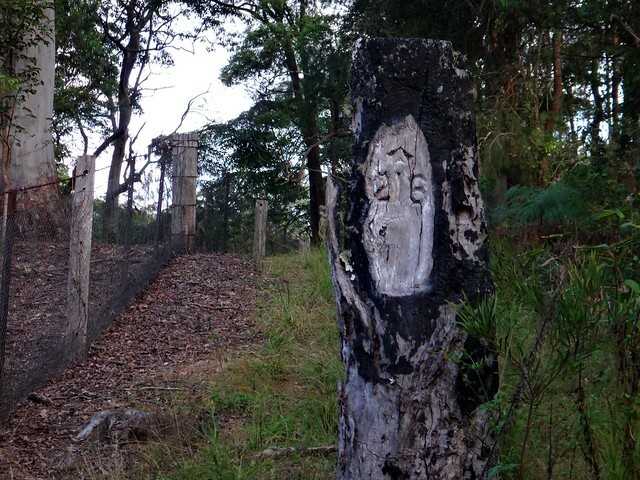 Survey markers along the fence line hint at perilous work carried out by surveyors Roberts and Rowland in the 1860’s as they meticulously mapped the border between the two states. The fence line appears rideable to me. I think I’ll be returning with some crazy friends and mountain bikes in the near future! 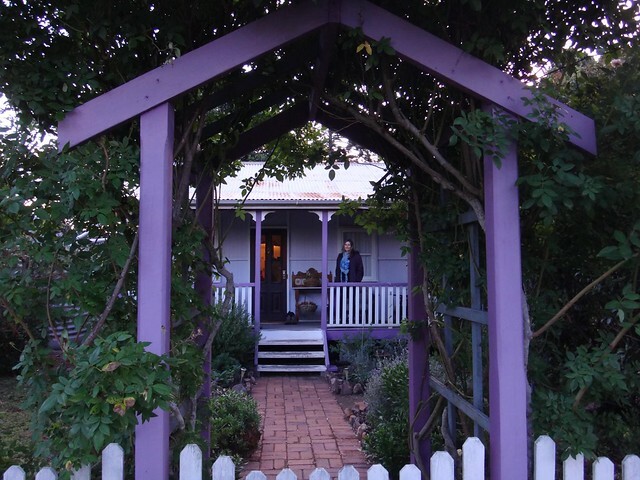 That evening, after returning to our cosy cottage, we spent some time with our hosts, John and Micheline Guy. Micheline’s Scottish heritage inspired the theme of this beautiful B&B. 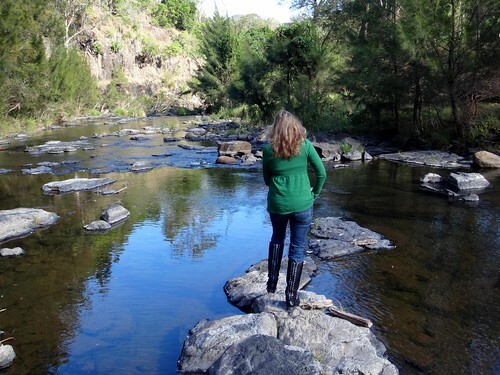 Her ancestors hail from the Highlands of Scotland – half a world away from the setting of this retreat in the “Highlands” of Southern Queensland. John, a former Commando in the Australian Army’s pretigious SAS has some fascinating stories to tell. While we sipped on his home-made Whisky (which tastes surprisingly like a Speyside Single Malt), and sampled his home-brewed Ale, he regaled us with stories of Ghurkas, Courage and Honour. I could have listened all night. I loved being able to share this experience with Liz. I often experience wonderful places, but the thing that makes them memorable is sharing them with loved ones. 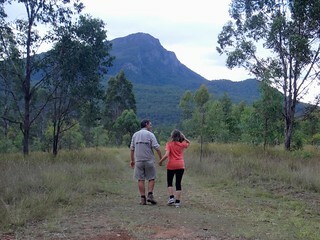 Thank you Liz for making this short two-night holiday in the “Highlands” of Queensland perfect. And thank you, John and Micheline, for being such generous hosts! Thanks, I’m glad you liked it. I’d love to show you round here sometime. I think you’d love it. Maybe next time you’re here? A nice blog! Thanks for putting the time and effort into putting it up for others to share. 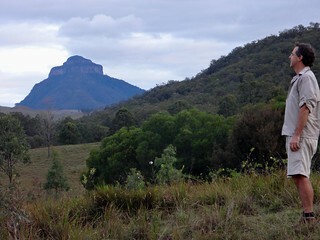 I’ve just come back from a day climbing Mt. Ernest (not far from Barney, but much less visited). I do agree with you about the spectacular scenery, and that wonderful, invigorating fresh wind! We loved our time in the that part of the world – thanks for reading our writeup. 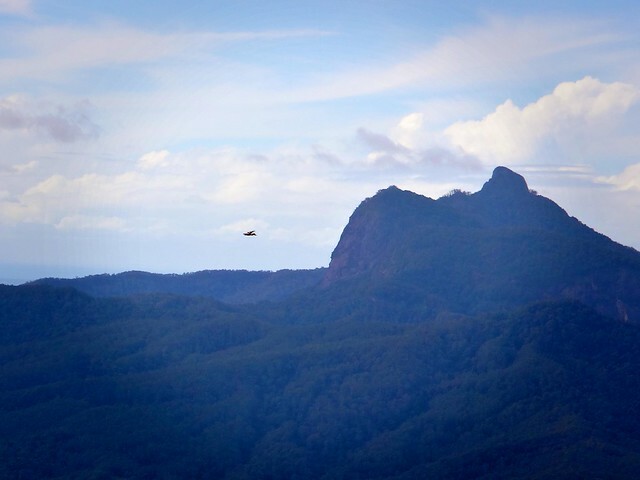 We really must get back to the Mt Barney region soon. It’s a great spot.